Background: Commonly used parameters for anteroposterior assessment of the jaw relationship includes several analyses such as ANB, NA-Pog, AB-NPog, Wits appraisal, Harvold's unit length difference, Beta angle. Considering the fact that there are several parameters (with different range and values) which account for sagittal relation, and still the published literature for comparisons and correlation of these measurements is scarce. Therefore, the objective of this study was to correlate these values in subjects of Indian origin. Materials and Methods : The sample consisted of fifty adult individuals (age group 18-26 years) with equal number of males and females. The selection criteria included subjects with no previous history of orthodontic and/or orthognathic surgical treatment; orthognathic facial profile; Angle's Class I molar relation; clinical Frankfort Mandibular plane angle FMA of 30±5° and no gross facial asymmetry. The cephalograms were taken in natural head position (NHP). Seven sagittal skeletal parameters were measured in the cephalograms and subjected to statistical evaluation with Wits reading on the true horizontal as reference. A correlation coefficient analysis was done to assess the significance of association between these variables. Results: ANB angle showed statistically significant correlation for the total sample, though the values were insignificant for the individual groups and therefore may not be very accurate. Wits appraisal was seen to have a significant correlation only in the female sample group. Conclusions: If cephalograms cannot be recorded in a NHP, then the best indicator for recording A-P skeletal dimension would be angle AB-NPog, followed by Harvold's unit length difference. However, considering biologic variability, more than one reading should necessarily be used to verify the same. An accurate anteroposterior assessment of the jaw relationship is critically important not only for orthodontic treatment but also for orthognathic surgery planning. Among various parameters which have been proposed, the commonly used ones are angle ANB,  NA-Pog,  AB-NPog,  Wits appraisal,  and Harvold's  unit length difference. A new measurement for assessing sagittal discrepancies also has been introduced recently as the ''Beta angle.'' The cant or inclination of all intracranial reference lines is subject to biologic variations (e.g., Sella to Nasion, Porion to Orbitale), making them unsuitable for meaningful cephalometric analysis. Many authors have pointed out the inadequacies of Frankfurt Horizontal plane, which is one of the most commonly used intracranial reference lines. In 1993, Arnett and Bergman,  while emphasizing the importance of clinical assessment of the face, drew attention on the fact that a patient who clinically (in natural relaxed position) is Class I, can be wrongly diagnosed as having Class II or Class III facial appearance, if the cephalometric Frankfort horizontal FH plane does not coincide with the true horizontal (TH). To overcome the shortcomings of various methods of orientation for cephalometrics, Downs,  Bjerin,  and Moorrees and Kean  introduced the concept of natural head position (NHP) in orthodontics It was observed that the variance of NHP is significantly less than the variance of intracranial reference planes to the vertical. Cephalometric analysis based on NHP, therefore is a more rational approach. Since the sagittal assessment from the measurements projected on the TH in the NHP is the most accurate, we planned to correlate this assessment with various other readings in the conventional cephalometric analyses employed for the same purpose. This correlation will indicate which of the various conventional readings for judging skeletal dysplasia are relatively more dependable. Considering the fact that there are many values (with different ranges) which account for sagittal relation, and still the published literature for comparisons and correlation of these measurements is scarce, it was felt necessary to correlate among these values in subjects of Indian origin with pleasing facial profile and Class I dental relation. The objective of this study was to compare and evaluate the relative precision among commonly used variables for recording sagittal skeletal relation. This study was planned and executed in the Department of Orthodontics and Dentofacial Orthopedics, S.D.M. College of Dental Sciences and Hospital, Dharwad. A total of 50 subjects were selected. The sample included 25 male and 25 female adult individuals. As per departmental protocol, an ethical committee clearance of the institute was taken along with an informed written consent was obtained from the subjects before entering into the study. Individuals who were undergoing or had previously undergone any orthodontic and/or orthognathic surgical treatment were excluded from the study. The lateral cephalometric radiographs were taken on a digital machine (PLANMECA PM 2002 CC PROLINE, Helsinki, Finland). The cephalograms were taken in NHP and were obtained on 10 × 8 inch diagnostic film (KODAK X-OMAT K film-EKTA speed plus). The procedure for obtaining the radiographs in NHP was adopted as described by Raju et al. [Figure 1]. Matte lacquered polyester acetate papers (Garware Co. India), 75 μm in thickness, were used to trace the lateral head films. The tracing was done with a 0.3 lead pencil. A single operator performed the tracing in a standardized manner to avoid errors due to inter-operator variations. The linear and angular measurements were made by using a set square and protractor with an accuracy of 0.5 mm and 0.5° respectively. Total eleven parameters were assessed. 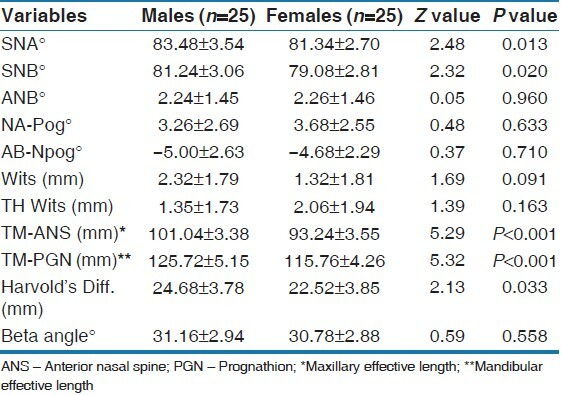 These included seven measurements which depict the relative anteroposterior maxillomandibular relationship and four measurements, which were components of the study parameters such as angle SNA, SNB to deduce angle ANB and maxillary and mandibular effective lengths to calculate Harvold's unit length difference. The data were summarized as Mean±SD. Two independent groups were compared by non-parametric Mann-Whitney U test (Z adjusted) as most of the variables under consideration follow non normal distribution. Spearman rank order correlation (rho) was done to assess association of TH Wits with other variables. A two-sided (α = 2) P0<0.05 was considered statistically significant. In the present study, to find out any significant differences among these measurements between male and female sample, Students t-test was applied [Table 1]. Most of the readings showed no statistically significant differences (P>0.05) between the two sexes. The individual skeletal parameters were then compared using TH-Wits as reference. This value is considered to be more reliable since it depicts the relation of points A and B to the TH; in other words, it is a measure of the subject's anteroposterior facial relationship in the pose in which he/she is generally perceived by others. [Table 2] depicts the statistical comparison between parameters using TH-Wits as reference (Total = males and females). In our study considering the entire sample, the readings showing non-significant P values (P0>0.05) were NA-Pog, Wits appraisal and Beta angle. This indicates that these values do not bear strong correlation with the TH-Wits. The values with which TH-Wits could be used interchangeably were values which showed significant P values, namely AB-NPog (highly significant) and angle ANB as well as Harvold's unit length difference (significant at 0.05). Similarly, when evaluation was done individually for the male and female samples, among male sample group non-significant P values ( P>0.05) were angle ANB, NA-Pog, Wits appraisal and Beta angle [Table 3]. In female sample group angle ANB, NA-Pog, AB-N-Pog, and Beta angle were showing non-significant P values ( P>0.05) while Wits Appraisal showed significant correlation with TH-Wits (significant at 0.05) [Table 4]. 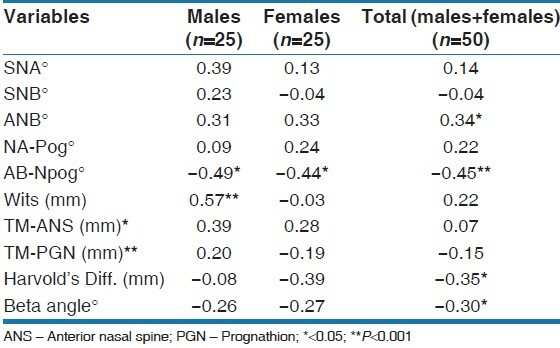 [Table 5] showed that the level of most of the skeletal and linear measurements were comparatively higher in males as compared to females except ANB, NA-Pog and TH-Wits. Comparing the skeletal and linear measurements between the two groups, the levels of SNA, SNB, Maxillary effective length TM-ANS, Mandibular effective length TM-PGN and Harvold's Diff. in males were found significantly ( P<0.05 or P<0.001) different and higher as compared to females. However, the levels of ANB, NA-Pog, AB-Npog, Wits, TH-Wits and Beta Angle did not differ ( P>0.05) between the two genders, i.e., found to be statistically similar. In males, AB-Npog showed significant ( P<0.05) and negative (inverse) correlation with TH-Wits while Wits showed significant ( P<0.01) and positive (direct) correlation with TH-Wits. Similarly, in females, AB-Npog also showed significant (P<0.05) and negative correlation with TH-Wits. In total (males+females) subjects, ANB showed significant (P<0.05) and positive correlation with TH-Wits while AB-Npog, Harvold's Diff and Beta Angle showed significant (P<0.05) and negative correlation with TH-Wits [Table 6]. Although ANB and Wits are cephalometric tools widely applied to evaluate AP relationships of the jaws, there is significant intrinsic lack of certainty in both assessments. This is the reason that most of the studies either correlated or compared these two values. 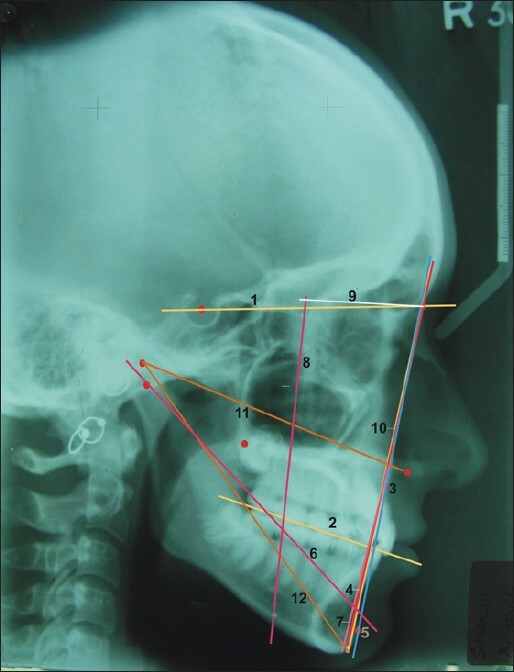 Consequently, there is intensive search for new and better cephalometric and non-cephalometric diagnostic resources to assess jaw discrepancies. This research is needed because vital orthodontic decisions depend on correct assessments. In the study of Rotberg et al. the ANB and ''Wits'' values of fifty patients were correlated to see how accurately one can predict the ''Wits'' value, given the ANB measurement. There results showed no correlation between these two values when the ''Wits'' measurement is negative. Jδrvinen [ 19 ] attempted to establish the relationship between the ANB angle and the Wits appraisal by measuring the individual variations in their reference systems, and by constructing a model of regression between them and a few parameters describing the reference systems. The results of their study indicated that approximately 93% of the variation of the Wits appraisal could be explained by the variation of the ANB, Nasion Sella Line/Occlusal line NSL/OL, and SNA angles. Del Santo  observed the influence of occlusal plane inclination on the ANB angle and the Wits appraisal in 122 finished orthodontic patients' lateral cephalometric radiographs. The result showed that there was a tendency for inconsistency between ANB and Wits assessments in the high occlusal plane angle group and a tendency for consistency in the low occlusal plane angle group. In our study, we attempted to correlate six sagittal skeletal measurements including ANB and Wits appraisal with TH Wits in fifty individuals including equal number of males and females. Among entire sample, ANB was significantly correlated with TH Wits, while ''Wits'' showed same type of correlation in female sample group. However, highly significant correlation was seen between AB-NPog with TH Wits. So this supports the Jδrvinen study which showed more variation of Wits appraisal as compared to ANB angle. Therefore, if Wits appraisal is to be used, it should be used only in conjunction with other methods of assessment of apical base discrepancies and with due regards for the likely effects of changes in its component parts. Viazis  published an article on comprehensive assessment of anteroposterior jaw relationship. In this, he derived the means for assessment of jaw bases using TH as a reference plane. He mentioned that TH Wits provides a clearer picture of the AP relationship of the jaws than the original Wits, which can be affected by the inclination of the occlusal plane or Frankfort Horizontal. In our study, the mean value of TH Wits was 1.7±1.9 in the sample size of 50. The difference between this reading and that of Viazis might be because of ethnic and racial differences. 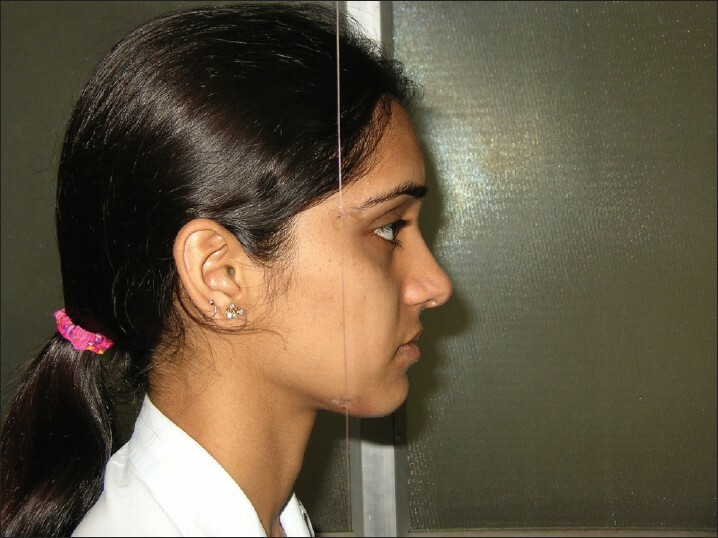 In an attempt in correlating various sagittal measurements, one study was executed by Kataria and Maheshwari  comparing App-Bpp and Ab-Bb sagittal parameters with the conventionally used ANB and A occlusal to B occlusal AO-BO parameters to evaluate the reliability of these parameters in the anteroposterior jaw analysis. They derived a coefficient of correlation among various sagittal parameters used in their study. Their results indicated that all the four sagittal parameters were closely related to each other and may be used interchangeably. Similar kind of correlation has been established in our study in which six sagittal parameters were correlated with TH Wits. The values with which TH-Wits could be used interchangeably were values which showed significant P values, namely AB-NPog, angle ANB and Harvold's unit length difference. The Beta angle is among the latest measurements used to record the AP skeletal problem. However, based on the results of our study we could not correlate its efficacy as an indicator of skeletal discrepancy. Results of our study showed that if cephalograms cannot be recorded in a NHP, then the best indicator for recording A-P skeletal dimension would be angle AB-NPog, followed by Harvold's unit length difference. However, considering biologic variability, more than one reading should necessarily be used to verify the same. 1. Riedel RA. The relation of maxillary structures to cranium in malocclusion and in normal occlusion. Angle Orthod 1952;22:142-5. 2. Downs WB. The role of cephalometrics in orthodontic case analysis and diagnosis. Am J Orthod 1948;34:812-40. 3. Jacobson A. The "Wits" appraisal of jaw disharmony. Am J Orthod 1975;67:125-38. 4. Harvold EP. The activator in orthodontics. St. Louis: CV Mosby; 1974. p. 37-56. 5. Baik CY, Ververidou M. A new approach of assessing sagittal discrepancies: The Beta angle. Am J Orthod Dentofacial Orthop 2004;126:100-5. 6. Arnett GW, Bergman RT. Facial keys to orthodontic diagnosis and treatment planning. Part I. Am J Orthod Dentofacial Orthop 1993;103:299-312. 7. Downs WB. Analysis of the dentofacial profile. Angle Orthod 1956;26:192-212. 8. Bjerin RA. Comparison between the Frankfort horizontal and the sella turcica-nasion as reference planes in cephalometrics analysis. Acta Odont Scand 1957;15:1-12. 9. Moorrees CF, Kean MR. Natural head position: A basic consideration in the interpretation of cephalometric radiographs. Am J Phys Anthropol 1958;16:213-34. 10. White TC, Gardiner JH, Leighton BC. Examination of the patients. Orthodontics for Dental Students. 3 rd ed. Hong Kong: Macmillan Publishers; 1976. p. 255. 11. Raju NS, Prasad KG, Jayade VP. A modified approach for obtaining cephalograms in the natural head position. J Orthod 2001;28:25-8. 13. Rakosi T. Significance of Angular and Linear Measurements for Dentoskeletal Analysis. An Atlas and Manual of Cephalometric Radiography. London: Wolfe Medical Publications Ltd.; 1982. p. 55-8. 14. Cooke MS, Wei SH. A summary five-factor cephalometric analysis based on natural head posture and the true horizontal. Am J Orthod Dentofacial Orthop 1988;93:213-23. 16. Proffit WR, Fields HW. Orthodontic Diagnosis: The development of a problem list. Contemporary Orthodontics. 3 rd ed. St. Louis: Mosby; 2000. p. 179-80. 17. Viazis AD. Comprehensive assessment of anteroposterior jaw relationships. J Clin Orthod 1992;26:673-80. 18. Rotberg S, Fried N, Kane J, Shapiro E. Predicting the "Wits" appraisal from the ANB angle. Am J Orthod 1980;77:636-42. 19. Järvinen S. Relation of the Wits appraisal to the ANB angle: A statistical appraisal. Am J Orthod Dentofacial Orthop 1988;94:432-5. 20. Del Santo M Jr. Influence of occlusal plane inclination on ANB and Wits assessments of anteroposterior jaw relationships. Am J Orthod Dentofacial Orthop 2006;129:641-8. 21. Kataria GK, Maheshwari S. An appraisal of various cephalometric parameters in the assessment of sagittal relationship between the maxilla and mandible. J Ind Orthod Soc 1999;32:83-90.